Are you one of the 10% of people who suffer from dry mouth? Dry mouth (xerostomia) is a condition that is a direct result of a decreased amount of saliva production. Those who have dry mouth often have moments when it is hard to talk. Dry mouth can also cause malnutrition for those who have it. Extreme cases of dry mouth can produce significant and permanent mouth and throat disorders. About 10% of all people are affected by dry mouth, and more women than men are those diagnosed with dry mouth. Elderly people and those who are taking medications are usually affected by dry mouth as well. 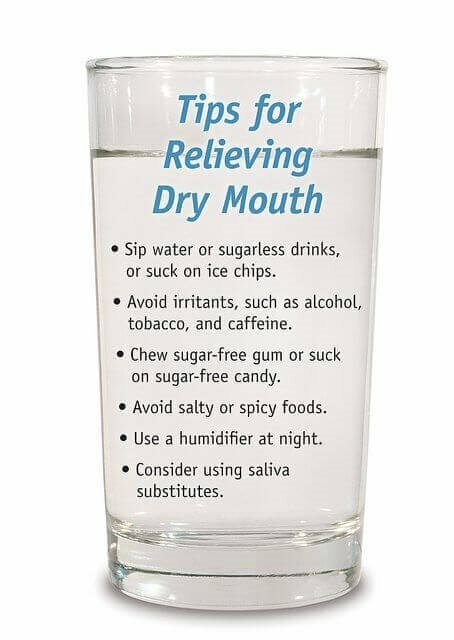 Check out the below infographic for tips for relieving dry mouth. This entry was posted in Tribeca Smiles Dental Blog and tagged And Treatment Tips For Dry Mouth, Causes, causes for dry mouth, Definition, dry mouth, dry mouth affects, dry mouth causes, dry mouth symptoms on August 7, 2014 by tribecasmiles.